When you need a little boost during your day but don't want all the caffeine of coffee, a recipe for homemade hot chocolate is just what is needed. Hot chocolate and hot cocoa are similar, but they are not the same beverage. Hot cocoa is made with cocoa powder while hot chocolate is made with melted chocolate. Both will have a strong chocolate flavor but the hot cocoa will have a sharper edge to it while the hot chocolate will be sweeter with a creamier texture. It is generally known that a little bit of liquid, whether it is water, milk, or whatever, when added to melted chocolate will make it seize. What is often not known is that enough water added to the melted chocolate will make it liquid again. As with the recipe for hot fudge sauce, you can add water to melted chocolate and get a creamy result. With our recipe for homemade hot chocolate, you can either use milk or water, either of which when added to chocolate in small amounts would have disastrous results. In order to avoid having a grainy, lumpy chocolate mess rather than smooth, creamy, silken chocolate euphoria, you need to use the proper liquid to chocolate ratio. 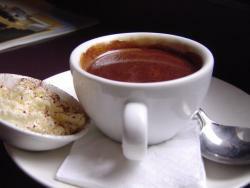 For two cups of hot chocolate, you need two cups of water or milk to every 6 ounces of chocolate. Any chocolate that you have on hand can be used to make hot chocolate. I like to use chocolate chips because I usually have them around, they are easier to weigh out, and they are already in a quick to melt size. But if you happen to have a large block of chocolate you can use a knife with a serrated edge to cut the chocolate down to usable pieces. If you have baking chocolate, which is unsweetened, then you will have to add sugar to your recipe for homemade hot chocolate or it will be unpalatable. Melt the chocolate in a Bain Marie. Heat the milk in a saucepan over a low flame. Add the chocolate to the warm milk. At this point you can add a nice liqueur to your hot chocolate if you are so inclined. An alternate procedure would be to put the chocolate and milk into the same pot and slowly bring it to a simmer, stirring it constantly. Both methods will result in a very delicious beverage.